Has your gymnast been invited to the TOPS Gymnastics Program? Or are you just curious what it is? I have been getting lots of questions recently about TOPS: what it is, what the requirements are, and why do it. Let me answer them! TOPs, or the Talent Opportunity Program, was created 22 years ago to find young talent. TOPs (Talent Opportunity Program) is a talent search and educational program for female gymnasts ages 7-10 and their coaches. The Talent Opportunity Program (TOPs) is an identification system that is implemented by the Developmental Team Coordinator under the direction of the International Elite Committee. Its purpose is to assist the coach with early identification of potentially talented athletes and to nurture and assist in the development of these athletes and their coaches and to provide competitive opportunities. So as you can see from the quotes above, TOPs is a program USA Gymnastics uses to find gymnasts with a “special” talent for gymnastics. The goal is to have a strong national gymnastics team; I think the fact that it is under the direction of the International Elite Committee illustrates this point. Since the goal of TOPs is to identify gymnasts with a “special” talent that if coached right, can become a very high-level gymnast, the program is focused mainly on strength, conditioning and flexibility. TOPs gymnasts also learn some specific gymnastics skills that are building blocks to other high-level skills. They learn these skills at a faster pace than is typical in the JO Program (gymnastics levels 1-10). Gymnastics is a sport where gymnasts peak at a relatively young age; most gymnasts that make it to the Olympics go when they are only 16-17 years old. Since TOPs training tries to accelerate a gymnast’s progression, it is very demanding. This is why coaches only select a small percentage of athletes to train for TOPs. Selecting the wrong gymnast for TOPs training could have a negative impact on the gymnast’s confidence and they could start to think gymnastics is not very fun and want to quit the sport. However, the right gymnast in the TOPs program can experience increased confidence and motivation. Gymnasts that are chosen by their gyms (not all gyms have gymnasts that train TOPs) to compete in TOPs are first evaluated at a state or regional TOPs test. These tests take place during the months of June and July. At a state or regional level test, gymnasts are only evaluated on six physical abilities (these are listed below). If a gymnast scores competitively compared to other gymnasts in her age group, she may then be invited to the National TOP test. This test takes place in October. The athletes that score the highest at the National TOP test are invited to a National TOP Training camp in December. Both the National TOP Testing and Camp take place at the National Training Center at the Karolyi Ranch, a U.S. Olympic Training site. Rope Climb: Gymnasts must climb 12 feet with their legs in a pike position. Handstand Hold: Gymnasts must hold a handstand for 30 seconds with correct body alignment. Press Handstands: 7 and 8 year old gymnasts must do 5 press handstands, 9 and 10 year olds must do 10. Cast to Handstands: Gymnasts much do 5 cast to handstands. Handstands must be within 15 degrees of vertical in order to be counted. Flexibility Test: The flexibility test is a sequence of 6 kicks and 6 holds. Each of these tests is worth 10 points and is evaluated based on the degree the test was completed, and on whether it was done with proper form. You can see more information about the physical abilities tests here, including how they are scored. 7-year old gymnasts only test the 6 Physical Abilities. 8, 9, and 10-year-old gymnasts also do basic skills testing on Bars, Beam and Floor in addition to the physical abilities tests. You can check out the 2015 skill test requirements here. What are the Advantages of the TOPs Program? It’s more focused: Training for TOPs is focused on exactly what you need to learn and master to become a very successful gymnast. Gymnasts that only compete TOPs don’t have to waste time learning compulsory routines. They focus on becoming very strong and flexible, and learning the exact skills you will need to learn in order to learn higher-level skills. It’s how most gymnasts get to the Olympics: If you are wondering how to become an Olympic gymnast, one of the ways is to excel at the TOPs program. All five members of the Fierce Five, the 2012 Gold Medal Winning Olympic team, competed in the TOPS program. What are the Disadvantages of the TOPs Program? It’s not as fun: If I had a daughter in gymnastics, I would definitely be worried about burnout if she was competing TOPs. All you have to do is watch the video above to see that it doesn’t look like much fun. The testing is focused on strength and conditioning skills, and in order to master them guess what you have to do? Yep, condition constantly. Your gymnast might not get to compete: If your gymnast goes to a gym where they have their TOPs gymnasts also compete in the JO Program (Levels 1-10), then this won’t be a concern. But if your gymnast goes to a gym where their TOPs gymnasts don’t also compete, then she will miss out on this fun and potentially rewarding experience. So, Should I do TOPS? 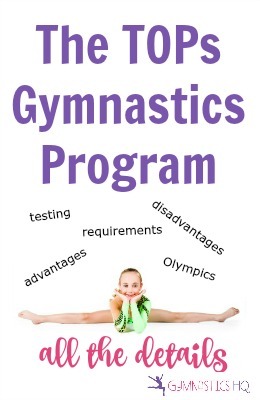 Even though TOPs is a program designed for those gymnasts with a “special” talent, I firmly believe that gymnastics is a great sport for all girls and that it has many benefits — raises self-confidence, keeps kids out of trouble, teaches them to lead a healthy lifestyle, they develop friendships, etc. I also think that most gymnasts will have more fun, and get more of these benefits by doing gymnastics through the Excel program, or through traditional gymnastics levels. What is my goal for my daughter with gymnastics and what is her goal? If I thought that she would want to really commit herself in the future to go far in gymnastics (many of the Olympic hopefuls are home-schooled and work out in the gym 30-40 hours a week), then she should try TOPs, assuming she is invited. If I thought she just wanted to have fun, participate in a sport, compete, and have a life outside of the gym, then I would pass on TOPs.